Mix one scoop (40g) in 200-300mls of water. Then blend, shake or stir until powder is disolved. Total Science Hydro Pure Peptide is the ultimate in comprehensive muscle building proteins, using only premium Ultra Pure hydrolysed whey protein isolate to help with recovery and nourishment. Hydro Pure Peptide consists of a minimum 20% degree of hydrolysis. Therefore equating to high levels of Di & Tri Peptides for rapid absorption, speedy recovery and lean muscle mass development. 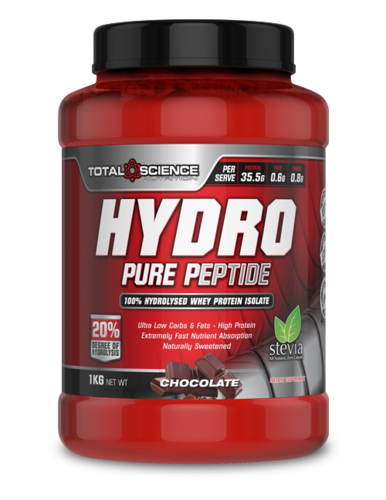 Hydro Pure Peptide provides a superior amount of nutritional value from enzyme-digested whey protein isolate, along with low fat and low lactose; resulting in 35.5g of Protein, 0.6g of Fat and 0.8g Carbohydrates. This advanced filtration process also results in the protein molecules being a lot smaller with a low average molecular weight of 1400 Daltons, making absorption rates extremely rapid to accelerate muscle and recovery. Hydro Pure Peptide is also naturally rich in digestive enzymes and branch chain amino acids (BCAAs).